Every Memorial Day, my family and I go camping at Birch Creek in Idaho. It’s the perfect place to take kids fishing and to help them catch fish on a fly. All of my kids like to join in on the action and they all have become big fans of tenkara. Like me, they like to yell “TENKARA!! !” in a Japanese accent with a Karate stance. Last year on Memorial Day after breakfast, I took my young son Benny fishing with my 2 weight St. Croix Ultra Legend fly rod, while my second daughter, Jenness, fished with my Tenkara USA Rhodo rod. We all fished this nice run with big boulders that we could stand on and a nice hole on both the upper and downstream ends. Ben came out and stood on the rocks with me. Nessy was with us and took some beautiful pictures as we landed a few trout. Nessy also caught a few fish on tenkara. Of all my kids, Nessy has really taken to tenkara and can’t understand what other fly fishers have against it. She feels that it is effective, easy and fun. I snapped a few photos of Nessy with her fish. I’m so proud of that girl! Nessy getting it done with tenkara! Not only did all my kids take up the challenge, but many of their friends, whose families were camping with us, wanted in on the action and the spoils. I suddenly feared that my wager was maybe a bit too generous. Eden and her best friend, Becca, went down to the creek below camp and I showed them how to cast with the tenkara rod from the bank, but then left them to their own devises. Surprisingly, those two young ladies caught a bunch of trout. Birch Creek was in a good mood and being generous. I took a few photos as they giggled and took turns. We even let Becca’s little brother, Lincoln bring in a few. After Eden’s success, my youngest daughter, Lily, wanted her turn with tenkara. Unlike Eden, Lily got right out into the shallow creek and waded beside me in her flip flops. Lily caught two fish that morning and was so excited. I was sure proud of her. Of course, I was starting to feel the forthcoming financial crunch from having to buy so many Jamba Juices for victorious kids. Lily picked tenkara up quickly. As Benny, my four year old, watched from the bank, I decided to let him bring in a few in from the bank. No, he didn’t hook them himself. I did and then handed him the tenkara rod. Some of my very favorite pictures of the trip are of him fighting the fish from the bank. I figured that this qualified him for a Jamba Juice too. Benny fights a fish on tenkara. As I will write about in another chapter, “Try Again Tom,” my son Thomas also caught two fish on tenkara. So all of my kids, except my oldest, Emma, who did not try, caught fish (yes, that’s six kids in all if anyone is keeping track). Call me cheap, but at six bucks a pop, a trip to Jamba Juice for so many kids didn’t seem too financially feasible. So I decided to renegotiate and, instead of Jamba Juice, ended up buying all my kids Stewart’s Key Lime Sodas. That was a little more friendly to my wallet and they loved it! Stewarts Key Lime: To the victors the spoils! Moral of the story: Don’t let your mouth write checks your wallet can’t cash. 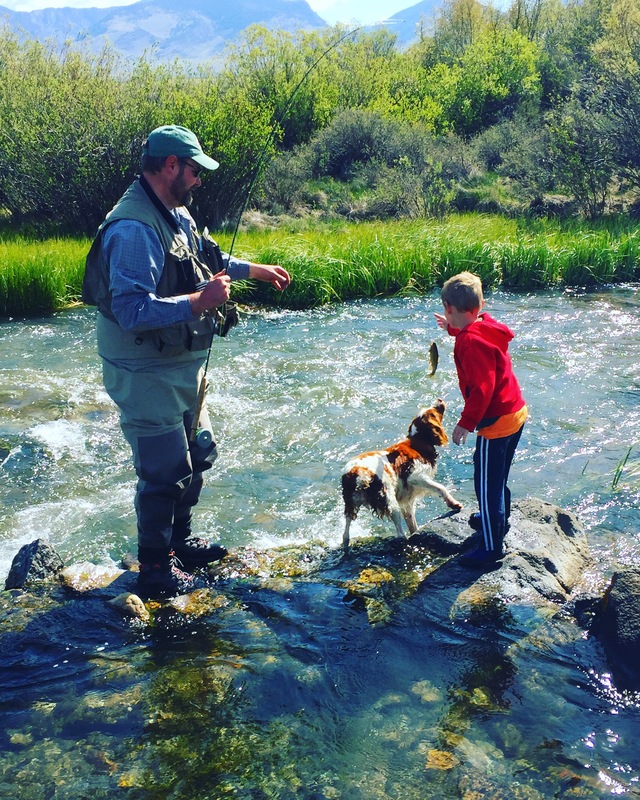 Tenkara just makes it so fun and easy for kids to catch fish. My wife and I named our son, Benjamin, after the great founding father, Benjamin Franklin. We later came to find out that the name means “son of the right hand” or “son of the old age” in Hebrew. Since he is the last of our six kids, I figure that both meanings are appropriate, especially since Ben inherited his old man’s love of the great outdoors and fishing. Last Friday, I took off from work early and Ben, who is almost five, said, “Dad, let’s go fishing!” I asked him a few times to make sure that he really wanted to go and he was resolute every time. So I donned my shorts and wading sandals and Ben put on his wading shoes. Of course, we stopped by the store to buy a few treats, Gatorade and Nut Rolls, before we headed to our destination. Rule # 1: When you take kids fishing, you have to get treats! Not far from home there is a tiny spring-fed creek loaded with Yellowstone Cutthroats that I dearly love. While it has a proper name, I call it “Trickle Creek.” I have found that when the runoff just starts to drop and the creek begins to clear, this creek really shines and you can catch a cutty in every likely spot. I often fish it with little fly rods, but it’s perfect for tenkara as there really is no need for a reel. The biggest fish is no bigger than 13 inches, but most are 8 to 10 inches. I figured this would be a great place for us to catch a few. Trickle Creek is a special place. When we reached our destination, I extended the Tenkara USA, Rhodo rod that is adjustable to three different lengths, 8’10”, 9’9”, and 10’6”, which is perfect for the tight conditions of Trickle Creek. Our fly for the night was a Renegade. Ben and I started catching fish almost as soon as we reached the water. Little Ben giggled with every fish and loved wading in the creek. He even didn’t mind brush bustin’ to get to some of the holes, although a few times I had to put him on my shoulders to avoid the stinging nettle and other scratchy weeds. Ben’s smile reminds me why I love fishing so much. Our deal was that I would hook them and Ben would let them go. Of course, he had to name every fish before he let them go. Let’s see, there was Skippy, Flippy, Ringo, Chubby, and Roly, and so on and so forth. After landing numerous fish, I decided to let Ben bring them in and it was fun to see him fighting a fish on a rod that is easily four times his height. And he did just fine. I even let him try to cast a few times, but we need to work on that. Beautiful Cutty on a Renegage. Ben’s enthusiasm and sheer joy was contagious. I have fished this creek dozens of times over the years and I can honestly say this was the funnest, most memorable night I’ve spent on Trickle Creek. Little Ben brings in the last fish of the night. I’m looking forward to fishing with my little buddy into my golden years! Dad and Benkara fishing for fun on Trickle Creek.